EL PASO, Texas (CNS) — Move aside pancake breakfast. La Tilma Mexican Grill has brought parish dining to a new level. 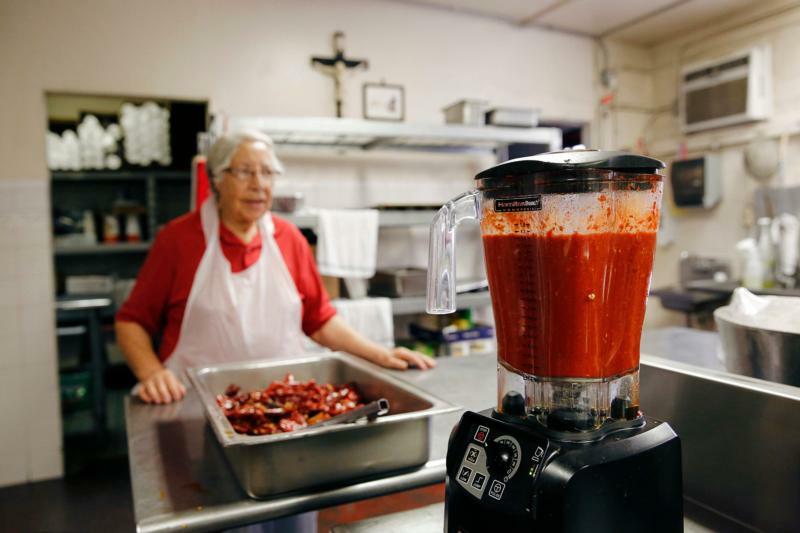 Taking its name from the miraculous cloak of St. Juan Diego, La Tilma is a ministry of Sacred Heart Church in El Paso’s Segundo Barrio, one of the city’s oldest communities. “This is the best breakfast deal in town,” said manager James Martinez on a break from taking orders one Sunday morning. He said the restaurant prepares home-style Mexican favorites at prices that can’t be beat. Each Saturday and Sunday a team of cooks assembles plates of eggs, chilaquiles, beans and tortillas. Red chiles are prepared by hand for chilaquiles, a dish of fried corn tortillas and red chile sauce. Steaming soups are ladled into cups and triangles of soft tortillas constantly sizzle at the fry station. Everything is made fresh to order. La Tilma is a nonprofit business but working there is not a volunteer opportunity. The positions are paid, in line with the mission of the grill and parish’s social ministry efforts, Martinez said. The restaurant has eight people in full-time positions and adds temporary workers for large catering jobs. The pay is $9.09 an hour, above the Texas minimum wage of $7.25. Restaurant and catering training is the aim of La Tilma’s business plan. “We hope that people will receive skills to take to other jobs in the restaurant business,” Martinez said. The community also benefits from the restaurant’s low-cost meals. A generous breakfast special — two eggs, chilaquiles, beans and tortillas — is priced under $4 and includes coffee. A plate of four tacos, with beans, rice, salad and tortillas is $4.95. At $5.95, the grill’s combination plate, “platillo mexicano,” is the most expensive item on the menu. La Tilma’s offerings include other Mexican favorites like “menudo,” a rich soup made with beef tripe; “caldo,” chicken broth with vegetables; and “tortas,” a warm Mexican sandwich, served with French fries. Got a sweet tooth? Try the eatery’s “bunuelos,” fried pastries covered in cinnamon sugar, or its “capirotada,” a sweet bread pudding packed with raisins and nuts, flavored with cinnamon and topped with colorful candy sprinkles. The restaurant serves about 725 meals each weekend. But Martinez said it makes most of its money catering four to five large events each week. The restaurant is located in the parish hall behind Sacred Heart Church on South Oregon Street. It’s open to the public Saturdays and Sundays, 7 a.m.-2 p.m. local time, Friday evenings during Lent and for parish festivals and events. Catering is available year-round. I must go soon! My Abuelos use to live in back of Sacred Heart church.